We've moved 2 doors west of our classic location! Graphic novels, card games, and action figures may entangle you while exploring here, but you'll also find we carry a full line of new comics as well as quality back issues. With a huge, browseable back issue inventory, and weekly gaming events, DreamStrands has offered friendly, neighborhood customer service and something to kindle the imagination in kids of all ages for over a decade! A mail-order subscription service is available for those who can't get to a shop locally or often, and please feel free to email Gabriel if you're looking for something special. 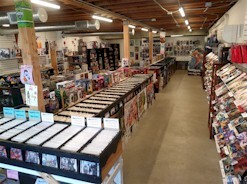 Nominated for best comic store in Seattle on King 5's "Best of Western Washington"